Why is the long term care conversation so important to have with Mom and the women in your life? We're sure you already know that the life expectancy of women is higher than that of men, but did you know the difference is an average of 5 years. Also, women have higher rates of disability and chronic health problems. American Association for Long Term Care Insurance reports that women represent more than two-thirds of Americans age 85 or older, and more than 70 percent of nursing home residents are women! The long term care conversation is gaining more and more steam. The opportunity and responsibility is now for you and your clients to have the conversation with Mom. Ask her about her health and finances to get a better understanding of what she may need later in life. There are long term care and critical illness riders to help with these costly expenses. You and your clients can start the planning today to better protect for tomorrow. Share these statistics with your clients. 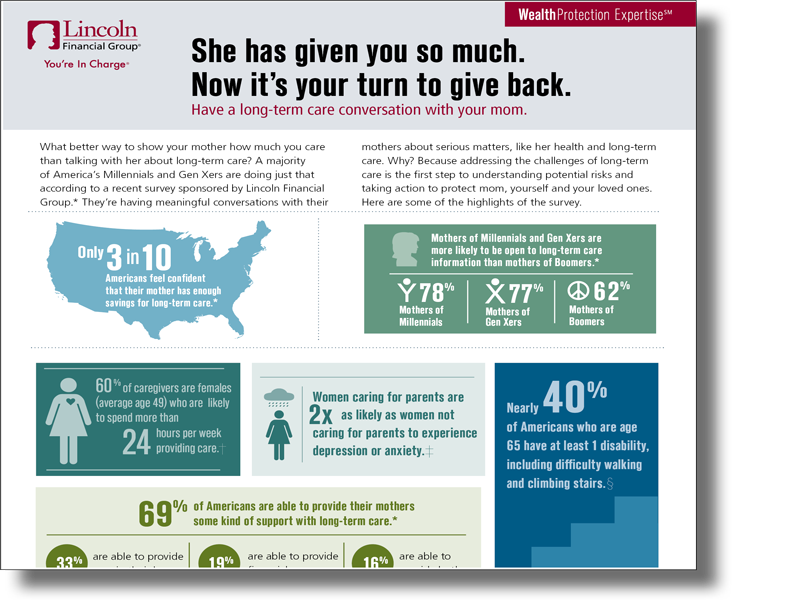 Download the infographic below and share with your clients they to begin the conversation with their moms. Speaking with your clients about their retirement and financial future will help to build relationships and secure your clients assets in their retirement. Speak with one client a week on LTC benefits and drive your sales goals in 2017!